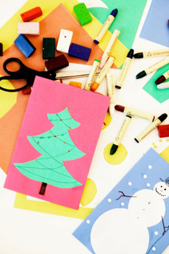 Creative holiday cards that are as fun to create as they are to open. • Multiply your greeting. A photo card can be a showcase for the perfect single shot, whether a group portrait or the best photo you took of the kids on vacation. This year, if you haven’t done so yet, explore the multiple-photo format offered among the layout options available. A collage or a simple series is a great way to feature close-ups of each family member, or of scenes from various family events throughout the past year. • The artist’s touch. Do you have a budding Picasso in the family? Instead of using a photo, make your holiday card more creative with a festive drawing or illustrated message from your children. You could also have each family member make a small drawing that, when they’re arranged together, forms a greeting. Then, scan or photograph the mini-masterpieces to create a standard photo card. • Greet with a treat. If you enjoy holiday baking, make a special batch of sugar or ginger bread cookies or festive cupcakes. Then, have family members pitch in to decorate the cookies or cupcakes so that they form a readable message by combining, for example, frosting letters or words, and candy canes and gum drops. Photograph the family displaying their decorative greeting, or photograph the message displayed on a pretty platter. The result will be a creative holiday card that offers a delightful greet – and treat. If you choose to stick with the standard one-photo format, flex your creative muscles with a fun pose or special accessories, including pets. Whichever photo format you select, your creative holiday card will delight friends and family with a fresh take and a little “ho-ho-ho” surprise.